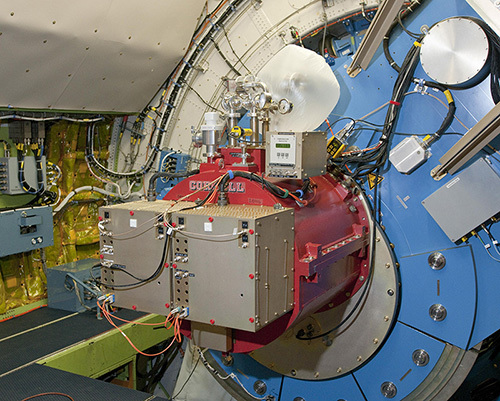 The Faint Object infraRed CAmera for the SOFIA Telescope (FORCAST) is a Facility class Science Instrument. FORCAST is a dual-channel mid-infrared camera and spectrograph sensitive from 5 – 40 μm. Each channel consists of a 256x256 pixel array that yields a 3.4'x3.2' instantaneous field-of-view with 0.768'' pixels, after distortion correction. The Short Wave Camera (SWC) uses a Si:As blocked-impurity band (BIB) array optimized for λ < 25 μm, while the Long Wave Camera's (LWC) Si:Sb BIB array is optmized for λ > 25 μm. Observations can be made through either of the two channels individually or, by use of a dichroic mirror, with both channels simultaneously across the entire range. Spectroscopy is also possible using a suite of grisms, which provide coverage from 5 – 40 μm with a low spectral resolution of R = λ/Δλ ≈ 200. Information applicable to the current observing cycle, Cycle 6, can be found in the FORCAST chapter of the Cycle 6 Observer's Handbook. Those submitting proposals for Cycle 7 must refer to the FORCAST chapter of the Cycle 7 Observer's Handbook. Be sure that you are referencing the correct version of the handbook!